Monte Carlo Weekly Photo: Anyone for golf? I'd love to take one of those little things for a quick spin. By the way I've tagged you on my site! 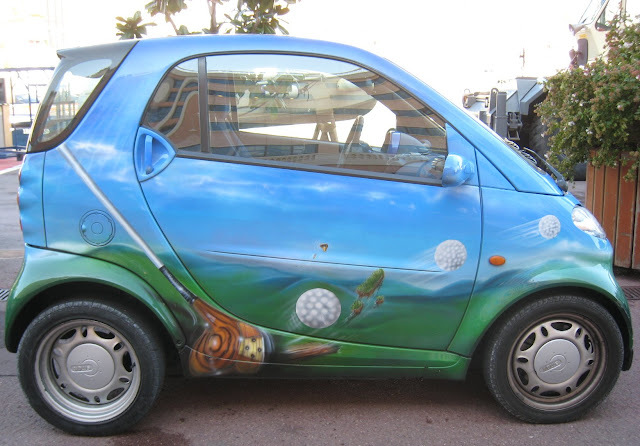 The Smart Car. . . .I'm amazed at how small it is! It's 40+ inches shorter than my MINI!! Oops! I forgot to add. . .No room for my dogs!! The golf ball is going to hit the lamp! Totally adorable! But this is a city car, right? I don't think anyone would drive that on the interstate highway. Ming, you see a lot of Smart cars down here - this one presumably goes from Monaco to the golf club - also school as I saw a child get out of it. They'd not be cars for a long haul on the motorway but certainly you see them there. Our autoroutes are only two lanes wide, sometimes three when it suddenly widens and speed limits restrict us anyway. Very cute car and design! Great photo.